Tidymart welcome the opportunity to be of service to your organization in supplying Iron Ore Fines in Break Bulk and Container basics. We can organise supply of Iron Ore in the following grades, 45%, 55%, 58%, 59%, 63.5%; inside these we can supply large volume of Iron Ore grade of 63.5% rejection below 62.5%. We organise supply Iron Ore Inspected by SGS or Similar with 1% or 2% non operative PB. We are renowned Iron Ore trading mart and have extensive relationships with leading mine owners in India and possess wide and acknowledged expertise in this Industry. We formed a small consortium with mine owners, traders and exporters to fulfil our client's needs interms of Quality, Quantity and Timely delivery. We work aggressively on behalf of our importers and co-ordinate regularly in order to fulfil our commitments as per schedules. 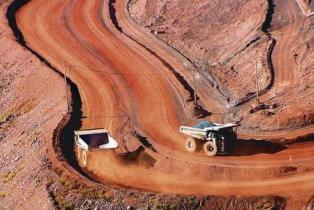 India has one of the largest iron ore reserves in the world. According to the available information India's iron ore reserves is around 22,000 million tonnes which will be sufficient for the next 150 years at the current rate of production of iron ore in the country. During 2005-06 India produced 147.27 million tonnes of iron ore. Out of this only 58 million tonnes were used for domestic consumption and the rest was exported. China is the main importer of iron ore from India and in fact India's exports (of iron ore) to China alone are far in excess of its domestic consumption. Shipments on FOB & CNF basis ranging from grades of 57% to 63.5% Shipments are through Chennai, Krishnapatnam, Kakinada, Vizag, Paradaip, & Haldia Ports in the East Coast area, and Goa, Mangalore, Belikiri and Karwar Ports in the West Coast area. Here we attached an LOI & ICPO form, for Buyer's convince. We need it on to buyers letter head (buyer means the issuer of the L/C) this is a draft of an LOI & ICPO this is our acceptable format. Buyers name, Address, Phone number, Fax number, Email address must be included, All our buyers are requested to download the LOI or ICPO from the following link and Fill, Sign, Seal send to our mail ID. Here we attached some sample FCO, for Buyer's convince. All our buyers are requested to download the FCO from the following link can be used only for sample purpose and for clarification. Further if you have any quires related to Iron Ore Fines import from India, kindly mails with your entire queries. We are here to assist you in every possible way for mutual beneficial.